Until 1987, contact between officers responsible for organising elections and electoral registration in the UK was minimal; it took place either within county groups on the occasion of county council elections, or the organisation of referenda or some other special reason for bringing like-minded people together. The only other occasions that electoral administrators met was at election administration courses either organised by the then NALGO Education Department or the South West Provincial Council. It was at one of these training courses that the idea of forming an association was discussed and a gathering of supportive colleagues organised at Wast Hills, Birmingham, in July 1987 which set the framework for the Association. This historic picture shows the shadow officers appointed at the Wast Hills meeting. 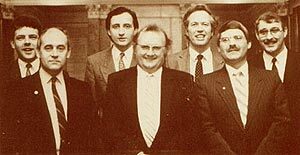 Left to right: Neal Sunners – Membership Secretary, Syd Peen – Public Relations Officer, Andrew Scallan – Secretary, Rod Tuck – Chairman, Peter Davies – Assistant Secretary, David Ellis –Treasurer, Charles Lasham – Vice Chairman. The inaugural meeting was held in Leeds in October 1987 and the first General Meeting/Seminar held in the English Riviera Centre, Torquay, in February 1988. 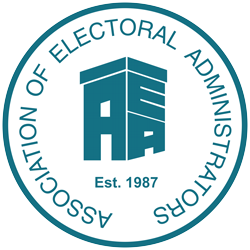 Due to the considerable efforts of many past and present serving officers, the Association has rapidly grown into the professional organisation that it is today and which plays a central role in electoral administration both at home and abroad.